Unique marks: Cross has a plethora of scars that she conceals. Cross focuses and fires her gun, amplifying the speed in which the bullet travels, and its accuracy. Cross Theorizes she is from another dimension, she can walk upon space itself, defy natural laws of physics, gravity, force, friction and others. She cannt impose her own qualities on objects, but defying the natural laws of this dimension can be done at will. For some reason since Birth Cross was always at peak physical condition and can get infinitely stronger and faster with rigorous training. With the combination of increased adrenaline Cross can close the gap between her and the strongest opponents with proportionate drawbacks. Upon unlocking her technopatich abilities, Cross instantly began experimenting on herself. To her pleasure. Or pain. This allows her to make up new weapons on the fly. Catapult her base power to amazing heights, absorb and process raw naten, as well as regenerate wounds. Cross’ ability to contain, process, logically, theoretically deduce, memorize and replicate information rivals some of Vescrutias greatest minds. It's what solidifies her spot as the Counselor of Technology and Advancement as well as makes her a terrifying foe. Longshot Rifle Cross' sniper rifle, nothing too special about it. Zasha Unit Cross' own personal mechanized unit of tigresses, made out of the Tiger Zasha. They come with all sorts of modifications and can be summoned at will in combat. Thermal Knife A knife that burns very hot and can cut through solid, tangible and intangible mateirals. Dual Pistols Cross' own signature guns that can be recalled to her person if she loses grip of them. The speed in which they fire can be immediately changed. They only activate to her touch, and do not require reloading. They can be loaded with extra ammo with different effects. Chrono Bullets these are very rare and hard to come by. They are a variant of the Stasis Grenade which freeze time in a general area. The Chrono bullet can disturb the afflicted body's temporal placement to such a degree they are unable to stabilize in this timeline. They can move slower permanently, or faster. Cross must program them before firing. LYFE syringe a healing syringe that restores Naten, wounds, and is an all around cure all from the essence of Gaia-Child of Genesis. Cross' arsenal is all listed here and thanks to her technopathic abilities she can create new weapons on the fly from readily materials so be prepared for anything! Legend tells of a Blue Blur, a demon of the abyss that stalked the night taking only what was needed and mercilessly massacring those who took advantage of the week. Or just killing people for fun. It was really bad. This Blue Blur was Cross, a young girl, a street Urchin of the abyss who knew no friends or family, thrust into a world of strife and survival having no resources or coin to her name. She took only what she needed from the abyss using her eerily prolific skills of stealth and subterfuge and made examples out of those who preyed on the weak. Granted these examples were murderous macabres, torturous methods that gave Cross’ otherwise very silent disposition life and meaning. She eventually heard tale of a certain Destroyer, not knowing that he had distanced himself from his prior life of barbarism Kham willingly let Cross fight him into submission to see if the rumors were true. Eventually, he took it upon himself to reform this creature, seeing much of himself in her, and assisted her in recognizing her true potential. Cross already had a gift for combat, the assassins art but with Khams vast resources and nicknacks she seemed to take a liking to crafting things and could interact with the ancient ruins from the Architects of Old, by deciphering ancient texts from time periods long ago through cultural tongues that were rumored deceased. Cross was a walking encyclopedia, a valuable ally to The Destroyer, ZK and their hodgepodge band of rogues. Unfortunately all the written records she had amassed through years of travel and exploration with Kham were lost in the destruction of the Abyss. The Power of the Heralds, their sheer presence sent Cross into a coma jettisoning her spirit into other realms awakening her repressed abilities. Here she saw a world vastly far developed that Vescrutia from elsewhere. Now having arrived in the abyss, Cross naturally assumed the role of Counselor of Technology and advancement. 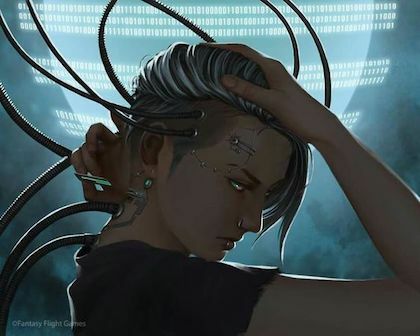 Her arbiter, Pandora, a sentient AI has given her the power of technopathy, merning naten with technological constructs perfectly. With her nigh unlimited resources she wants to know more about her past life, but has a duty to the Neovia, its protection and its advancement through the study of the Arbiter. Personality: Cross isn’t the most sociable of people and has a natural liking for murder, torture and nearly everything in between. She never speaks about her past or her time in the abyss. But loves messing with people and making them uncomfortable. She loves salty foods, especially popcorn. And enjoys playing video games, she also loves cats.